Sherlock’s third series is different. And it must be different considering the fact that Sherlock comes back after two years. Two years in which most of his friends were totally convinced that the only Consulting Detective is dead – and somehow managed to get on with her lives. Especially John Watson whose speech at the graveyard still makes fans cry and who owns Sherlock so much finally finds true love. „The Sign of Three“ concentrates on a marriage but in fact it is all about the friendship between Sherlock and John and how this relationship will go on despite the fact that Mary is about to become John’s wife. And so this second episode of the third season is Sherlock’s episode. The man who always stood at the edge of society, examining and watching but never really getting involved with other people because sentiment for him always has been a chemical defect found in the losing side, realizes that he is a human being. How Sherlock gets this conclusion and how he matures is heartbreaking and funny, thrilling and exciting and the best piece of entertainment that possibly could be brought to life on telly. And of course it wouldn’t be possible without the performance of Benedict Cumberbatch who again proves the fact that he is an actor in his own league. Yes, we know that he always is the character he performs and that his own personality vanishes completely. But it seems that Sherlock not only is the role that was made for him. This Sherlock really is Benedict’s one because he gives him all that he is able to give as a brilliant actor that loves playing a role and all the fun he obviously had on set. And of course you feel this fun and devotion by watching an amazing Martin Freeman whose John Watson is far more than just a supporting role. Without his John this series simply wouldn’t work because you can’t imagine that any other sidekick could be able to stand with and against Benedict Cumberbatch. 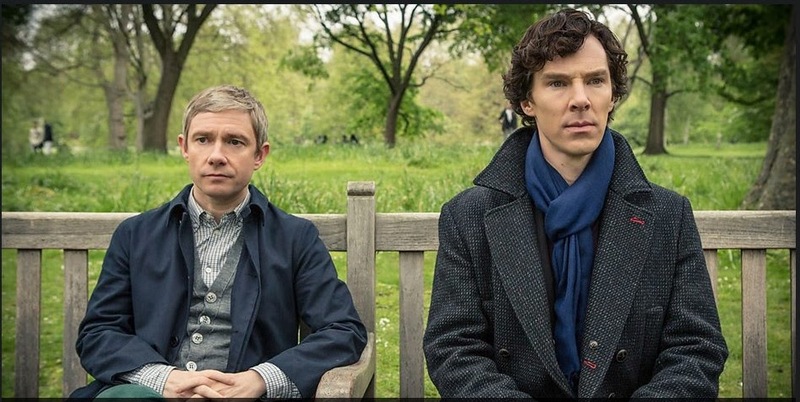 Watching them both together in a series that seems to get better with every new episode is only overshadowed by the fear that they will be far too busy with their now worldwide fame to get along with „Sherlock“. Still Benedict Cumberbatch and Martin Freeman have fun with this piece of art as they say in various interviews and it seems that the writers Steven Moffat and Mark Gatiss are already discussing plots for a fourth series. The fans may rest in peace at least till the last episode of this series airs.